Chennai Peeps, Are You Up For The Mother Trucker Challenge At Sitcom? 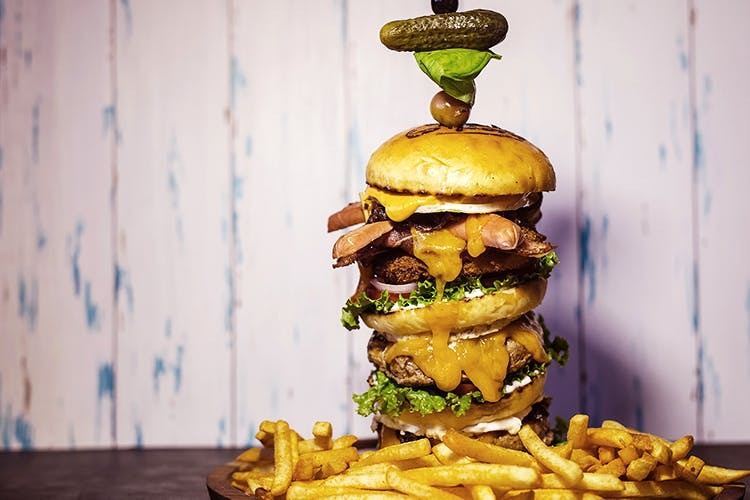 A 1.5kg burger and a portion of fries, with 12 minutes to finish it all – this is all you have to do to become a Mother Trucker champion. Are you ready? Sitcom – The Drama Diner in Neelankarai is hosting the most epic of all challenges and all it really takes is for you to inhale the entire portion presented to you within 12 minutes. Sure, it sounds really easy and quite doable, but think of the time frame and take a look at that burger. Holy moly. For those wondering, they have the Mother Trucker burger in three variations – vegetarian, chicken and beef – so everybody gets to participate. The burger looks the same for everyone, so don’t worry you’re not getting more or less than anyone else. In fact, the combination of the burger and fries weighs a total of 1.5 kg! But, there's lots more to check out. Take a look through their funky menu and you'll reminisce your fave TV shows while waiting for delicious food. So, head to Sitcom for some yum food and loads of laughs.